Let the roasting begin…we were dangerous low on coffee last week…less than 1 pound in the entire house. Then Bart our wonderful UPS driver dropped off the above shipment. The large bag in the lower left is 5 pounds of Monsooned Malabar AA the stuff on the right is 10 pounds of the Monkey blend Espresso and 20 pounds of Costa Rican Hernan Solis Villa Sarchi. This week we have bee drinking the Monkey blend. I get some of my beans from Sweet Maria’s in Oakland CA, One of the beauties of roasting your own is the economy of it…even with shipping I can get this great stuff for less than $6 a pound. By comparison the stale stuff at the supermarket runs 11 to 13 a pound. I have been a fan of the monsooned for years and I also have a weakness for the brightness of Central American coffee like this Costa Rican private estate lot. 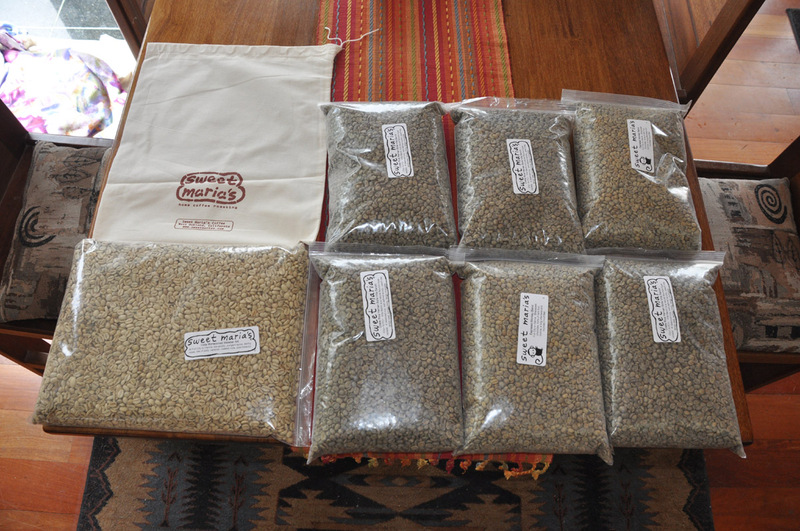 “This is a microlot is processed at Helsar del Zarcero mill, but is not a blended mill lot. It is from the farm of one producer, Hernan Solis, and is entirely one varietal of coffee, Villa Sarchi. Villa Sarchi cultivar is a natural offspring of the old Bourbon type coffee, adapted to the climate of Costa Rica and the Naranjo area in particular. Hernan’s farm is at 1600-1700 meters in a zone called Llano Bonito de Naranjo. The significance of the Helsar mill handling all Hernan’s coffee is key to the cup quality as well. You can grow great coffee from a great varietal at great altitude, then ruin it completely in the wet-process or drying. Helsar is a farmer-owned mill that has produced great coffee every year we have worked with them, and has continued to invest in their neighbors’ coffees as well by building more capacity to process small lots separately. The care put into this coffee at all stages is proven out by the taste. It’s a bright cup and also possesses nice body and balance. It’s a screamer, a high-toned coffee at City roast, but quite balanced at Full City roast level. It is versatile. A lot of people consider me a little bit of a coffee snob…but in actuality we are just fans of good stuff and love the great deals by roasting your own. Life is too short to drink crappy coffee, and crappy beer for that matter. We have been slumming it a bit lately as we ran out of our maple syrup last week too, we have been using just a dash of brown sugar in our Cappuccinos, If I can remember to bring the jug down with me later this week, I can stock back up next time I’m in the flats. The weather these last few days has been total “yuck-o”…today we have had off and on rain / snow and a few minutes ago it was actually thundering. I have missed the thunder these last wintery 8 months The snow in the yard is nearly gone…and if this rain keeps up tonight it will most likely be gone by morning. People in other parts of the country or even down in the flats do not fully understand what it is like live in the Mountains. Thursday the 19th update…the snow IS NOT gone…in fact we got about 6″ last night…if you did not know differently it could be Jan.